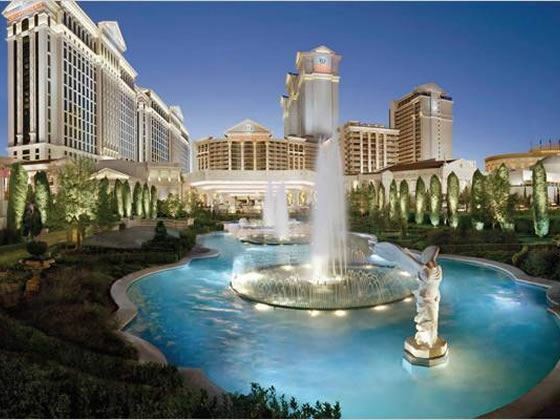 One of the original Las Vegas hotels, Caesars Palace is a world famous landmark, with it's ancient Rome theme a key attraction. It is a hotel on a grand scale, with a fantastic range of restaurants and bars, including some of the finest restaurants on the Las Vegas strip. Add this to nightclubs, casinos, cocktail lounges and a spa, you can really spoil yourself. And the icing on the cake is The Forum Shops - 160 speciality stores and attractions including all the big names like Armani, Louise Vuitton and Versace. Here you will also find a giant aquarium and a few more restaurants to tempt your tastebuds. This iconic hotel is located along the Las Vegas strip, characterised by its fabulous Roman-themed architecture. There are plenty of vibrant restaurants, casinos and bars for you to explore nearby. 3,348 in five towers - Roman, Centurion, Forum, Palace and Augustus. Qua Baths and Spa is a luxurious retreat that taps into the natural, healing powers of water to bring you a one-of-a-kind experience. Caesars Palace’s guests enjoy preferred access to two of the nation’s most beautiful golf courses, Cascata® and Rio Secco, as well as premier golf instruction at the Butch Harmon School of Golf. Casino with more than 129,000 square feet of casino space. Everything from high limit slots to your favourite table game. Caesars Palace features a 4.5-acre Garden of the Gods Pool Oasis. It’s truly a place fit for the gods, and an even better place for your group to relax and socialize. The Temple Pool - The circular Temple Pool is the focal point of the area with its 10,000 square feet of flowing water and is covered with a giant rotunda that tops a central island. As with all our pools, the temple pool is decorated with fine marble and granite and rimmed with ancient mosaics. The Neptune Pool - This 5,000-square-foot rectangular heated pool is ideal for lap swimming. This pool has three newly-constructed, lavish cabanas available for a daily rental. Caesars Palace boasts an international array of cuisine to tantalise, tempt and satisfy any diner’s appetite. From contemporary French fine-dining, to more casual fare, the hotel offers some of the best cuisine available in one of the world’s top food cities. Affording guests a haven of sophistication and service on par with the best boutique hotels in the world. 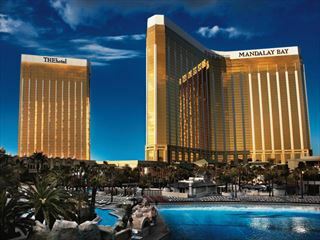 Mandalay Bay offers elegantly appointed suites, the ultimate in personal service and the world’s finest in dining and entertainment. 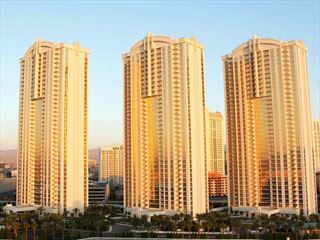 The Venetian is a luxury resort hotel located in the centre of the Las Vegas Strip. This fantastic, beautiful casino resort is a tribute to Venice itself, with accurate, near-scale replicas of Venetian landmarks and artwork built into the hotel’s stunning architecture. A stylish addition to the MGM Grand portfolio, The Signature’s suites are set within three beautiful and distinct towers and will provide guests with a serene retreat and an intimate setting where the focus is on personalized service.